Spain, or the Kingdom of Spain (Spanish: Reino de España), is a country located in southwest ern Europe on the Iberian Peninsula. Its mainland is bordered to the south and east by the Mediterranean Sea except for a small land boundary with Gibraltar; to the north by France, Andorra, and the Bay of Biscay; and to the northwest and west by the Atlantic Ocean and Portugal. Spanish territory also includes the Balearic Islands in the Mediterranean, the Canary Islands in the Atlantic Ocean off the African coast, and two autonomous cities in North Africa, Ceuta and Melilla, that border Morocco. 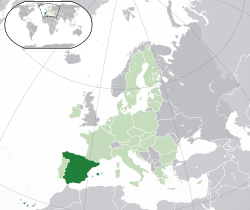 With an area of 504,030 km², Spain is the second largest country in Western Europe and the European Union after France. Spain is a democracy organised in the form of a parliamentary government under a constitutional monarchy. It is a developed country with the ninth largest economy by nominal GDP, and high living standards (16th highest HDI). It is a member of the United Nations, European Union, NATO, OECD, and WTO. Disfrute unas fantasticas vacaciones en un apartamento en la Costa del Sol, junto a la Cala de Mijas a 5 min de las mejores playas de Malaga. If you are travelling to Spain you will need Euros.